SAF-T-EZE® Marine Grade Anti-Seize provides protection as a high temperature anti-seize and extreme pressure lubricant. It stops corrosion, galling and seizure between metal parts. Marine Grade Anti-Seize provides ultimate protection as a high temperature anti-seize and extreme pressure lubricant and is recommended for service to 2000ºF. 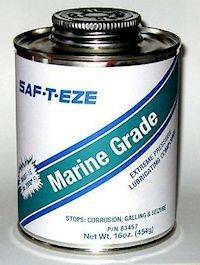 SAF-T-EZE® Marine Grade Anti-Seize is formulated to prevent rust and galling in fresh or salt water. It is compounded from a heat resistant lubricant developed to prevent water wash out. Marine Grade Anti-Seize is the best choice above or below the water line and meets and MIL-PRF-907E. 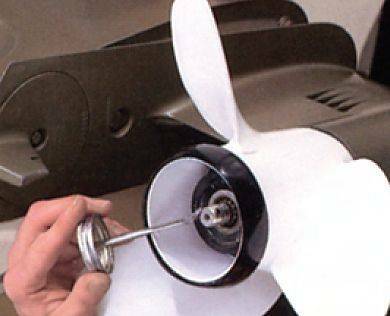 Marine Grade Anti-Seize can be used as a lubricant, a sealer, a break-in lubricant, a tapping compound on plastics as well as metals. Surfaces are best cleaned before application as grit or low quality oil/grease may be present and best performance is required. The reduction in assembly friction increases torque tension by about 20 percent. 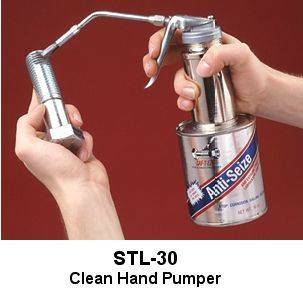 Use on threaded parts, bushings, gears, valve stems, chains, sprockets, levers, hinges, pivots, rollers, heat exchanger or manifold bolts, or as a gasket release agent, etc.